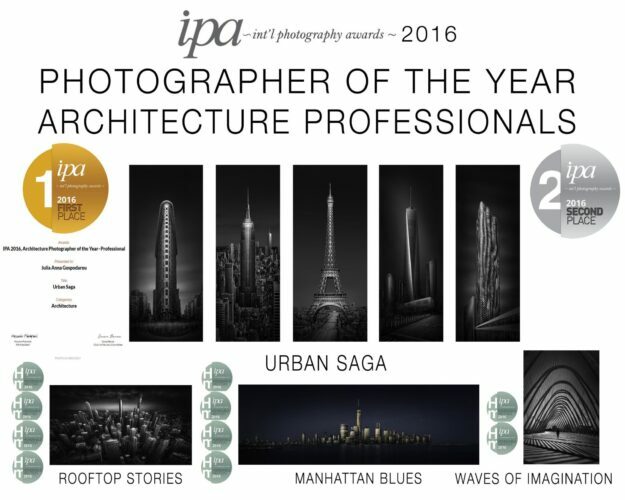 I’m hugely happy to have received the highest distinction for architecture photography at the IPA 2016, where I was awarded Architecture Photographer of the Year, for the Professional category. 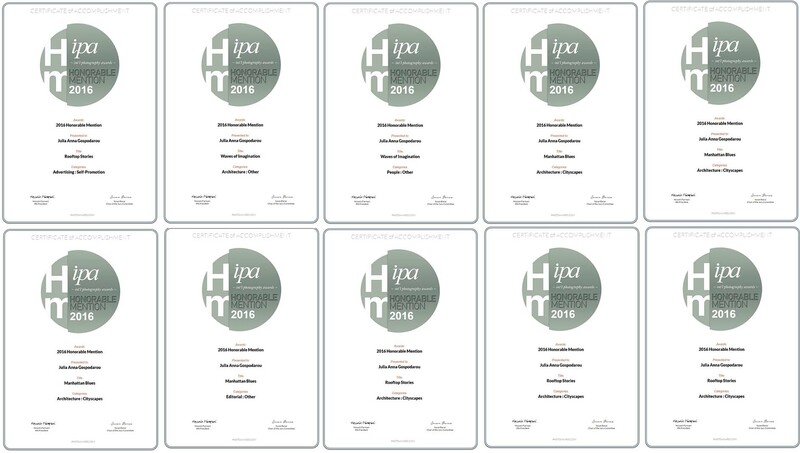 IPA, International Photography Awards, is the most prestigious fine art photography competition in the world and this makes my joy even bigger. The images were chosen among tens of thousands of photographs submitted from 162 countries. 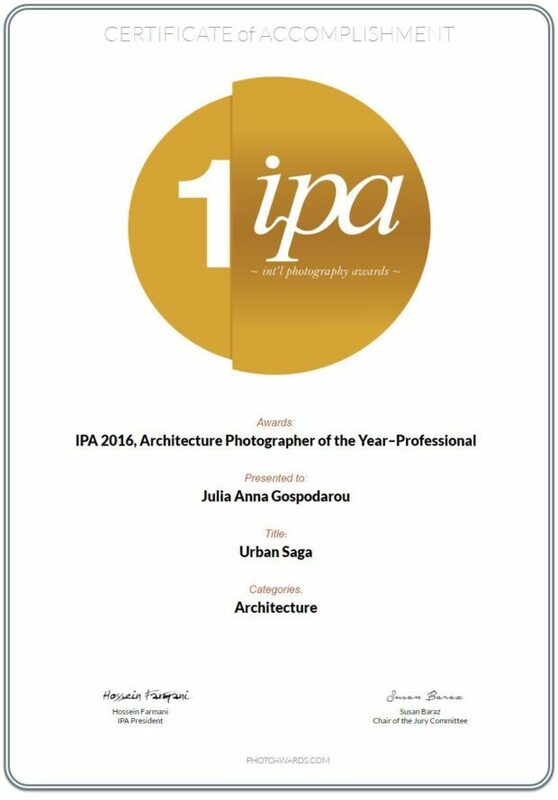 With this title, I will be a finalist for the overall title of the IPA Photographer of the Year that will be announced on October 23rd in the awarding ceremony at Carnegie Hall in New York. Fingers crossed for that! It is the second time I am a finalist in a major photography competition, after the SWPA World Photography Awards in 2012, where I was in the Top 10 shortlist in the final, and I can say now I’m even more excited about it. 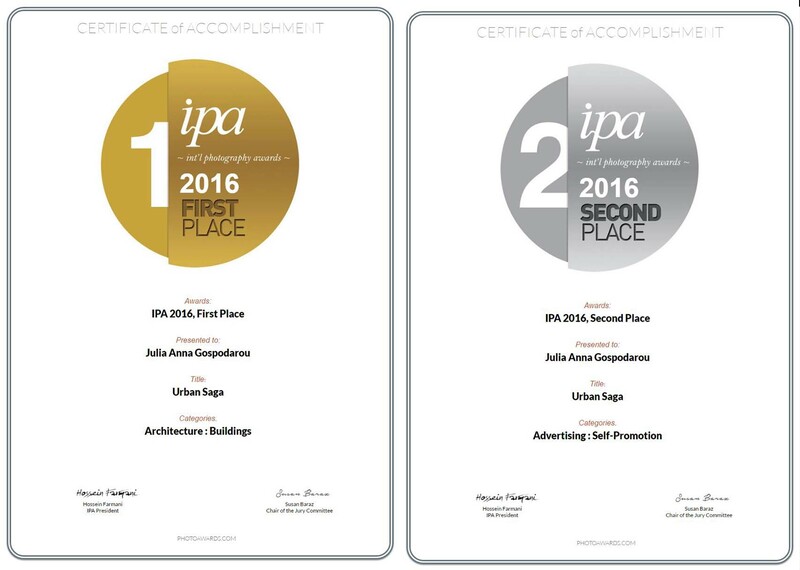 My series Urban Saga has received 1st PRIZE – GOLD and 2nd PRIZE – SILVER, and was chosen 1st PLACE Country Pick for Greece in all categories where it participated. Manhattan Blues, Rooftop Stories and Waves of Imagination have received a total of 10 HONORABLE MENTIONS in different categories. You can find some of these images as limited edition prints at Rotella Gallery in SoHo New York. During the past years, my photography was awarded more than 85 times, with more than 20 GOLD, SILVER and BRONZE medals and this is a very precious reward for the passion I put in everything I do in photography. There is nothing like being recognized for doing what you love and I am over the moon and so grateful that the appraisal is at such a high level. It adds even more meaning to what I do and gives me motivation to do it even better in the future. Big thanks to everyone who has supported me and congratulations to all the other winners! Next week I will be traveling to for my (en)Visionography workshop so I will not be able to attend the awarding ceremony at the Carnegie Hall in New York which is overlapping with the workshop. But I hope for the best and I’d be happy if you kept your fingers crossed for me on October 23rd. 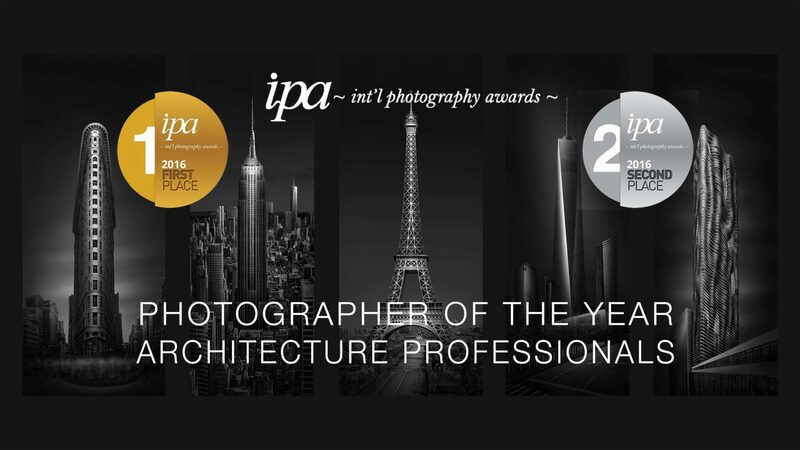 I’m very much looking forward to meeting my students and I will celebrate this great award with them making photography in one of the most inspiring and amazing cities of the world. After I come back I will announce my next workshop and I’m sure you will love the new location. So, if you would like to come join me, keep an eye on this space for news. You can subscribe to my blog to be sure you will receive the announcement as soon as I make it, since my workshops tend to sell out very quickly. Congratulations!! You deserve it! Your work is amazing and beautiful. I hope to be able to attend one of your workshops soon. Ever think of coming to Denver? Thank you Trent! Would be my pleasure to welcome you to one of my workshops. Denver is a great location. I’ll be thinking about coming there. Congratulations Julia Anna, the award is well deserved. I love your stunning work! Thanks very much Paul! Much appreciated. Many thanks Barbara! Happy you think so. Well deserved! Love your work. Well deserved Julia Anna, especially since you spend so much of your time and creative energy on your students and their work. Rather than work in isolation, you gather your pupils into your vision and take them along with you as you soar. I am proud and flattered to be one of your alumni and am always amazed at your prompt, polite and encouraging comments of anything I send you. I will be thinking great thoughts on 10/23. Thanks a lot Matt. I’m always happy to share what I know because I think beautiful things have to be shared. That’s how they stay alive. So much appreciated your support. Congratulations Julia, A well deserved award not only for your outstanding vision, but your willingness to share what you know with others. Thanks for the good thoughts Robert. They are much appreciated. Des récompenses bien méritées, toutes mes félicitations ! Merci beaucoup Thierry! C’est très gentil de ta part. Ë il premio non soltanto ad una fotografa eccezzionale ma alla sua anima fotografica e a quello che trasmette della sua visione. Sono ansioso ed orgoglioso di partecipare al suo workshop di Parigi. Molte grazie Osvaldo! Looking forward to meeting you next week. Congrats, Julia Anna….well deserved honor! Thanks so much Sharon! My best wishes! Congratulations Julia…well done, your work is truly inspirational and it goes to show that we should jump outside our square and go that little bit extra. Any chance you will have any workshops in Melbourne? Thanks very much Evan. It’s much appreciated. I don’t have Melbourne in my workshop schedule for the immediate future, but it’s very possible to come there in the future. Cheers! Congratulations to you Julia. I find your photographs incredibly inspirational and a bar so high to strive for. 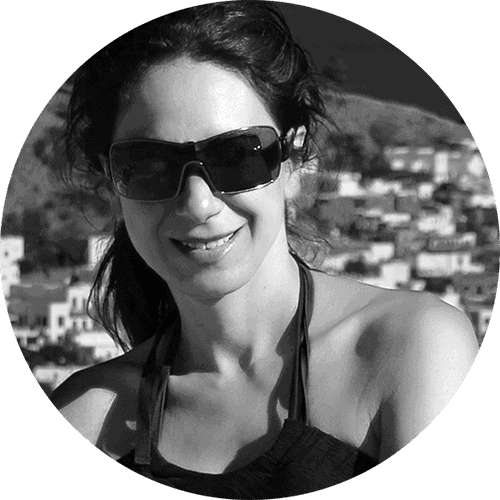 Your blog is terrific and has helped me a lot, you are very genorous with your knowledge. I definitely hope to take a workshop soon with you in North America. Hi Lance. Thanks so much for your good words. They humble me. Would be great to meet you at one of my workshops and I’ll be back in the US soon. All the best. Congratulation Julia Anna, you are a very great artist!